Pema Khandu was all praises for the actress' bold and fearless statement on actors who shied away from shouldering the responsibility of standing up for what is right. The list of dignitaries and celebrities coming out to acknowledge actress Kangana Ranaut‘s directorial debut in Manikarnika: Queen of Jhansi is increasing day by day and the latest entry into the list is Arunachal Pradesh CM, Pema Khandu. 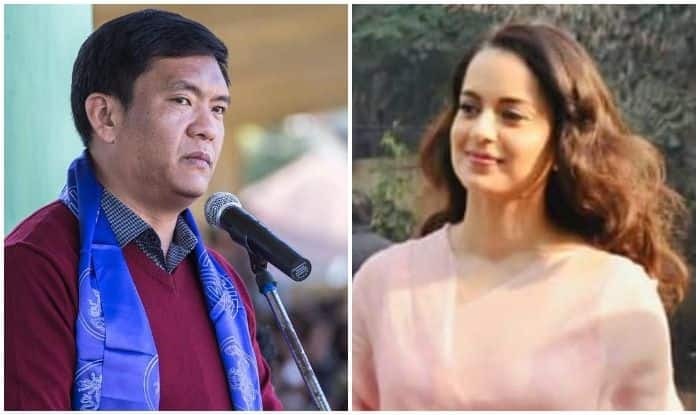 Taking to his social media handle on Sunday, CM Pema Khandu was all praises for the actress’ bold and fearless statement on actors who shied away from shouldering the responsibility of standing up for what is right. Taking to his Twitter handle, he retweeted a video in which Kangana is seen driving the point home as she talked to the press and captioned the video as, “Ms Kangana Ranaut Ji has rightly defined what it means being successful. Being successful means to shoulder social responsibilities, to take role as leader. @KirenRijiju @ChownaMeinBJP @TapirGao @bamangfelix @MoheshChai @GamlinJarkar @AloLibang @NabamRebia @TamiyoTaga” (sic). Kangana had earlier called out Bollywood’s hypocrisy in not promoting her films. In her statement recently, she took Alia Bhatt‘s name and said that she went all out to promote Raazi while Alia never took pains in promoting Manikarnika let alone supporting her in the controversy that erupted during the release of the film. Recently, actors Anupam Kher and Tanushree Dutta openly supported Kangana for fearlessly shouldering a big-budget Hindi film and fighting all who stood against her in the making of Manikarnika: The Queen of Jhansi. Meanwhile, Kangana’s Manikarnika: The Queen of Jhansi is slowly but surely making progress at the box office, and has earned a total of Rs 85.80 crore on day 15. The movie, which is about the life of Rani Laxmibai, had crossed Rs 50 crore on day 5 of its release, and by day 10 it had earned Rs 75 crore, and apart from the praise that Kangana has been getting for her directorial debut, it is also doing good business overseas.